Mens casual socks with Liverpool FC branding. 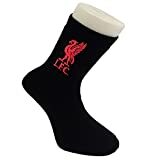 The Liverpool FC Socks are official Liverpool FC merchandise. Mens casual socks with Liverpool FC branding. Size: UK 6-11. 75% Cotton, 24% Nylon, 1% Elastane. Machine washable. The Liverpool FC Socks are official Liverpool FC merchandise. This entry was posted in Sports Kits and tagged Crest, Football, Liverpool, Men's, Official, Socks by All Kits. Bookmark the permalink.